Dr. Tomislav Mihaljevic recognizes the incredible responsibility that comes with being a cardiothoracic surgeon. It’s a profession in which his patients quite literally put their lives in his hands. But after performing roughly 4,000 surgeries in his career, Mihaljevic has learned that the mind is perhaps an even more powerful instrument than a surgeon’s hands. As Mihaljevic explains his cerebral approach to being a surgeon, it becomes easy to see why the Clinic chose him to succeed Dr. Delos “Toby” Cosgrove as its new president and CEO. All at once, he conveys a sense of the calm, the strength, the wisdom and the leadership he will need to lead this $8.5 billion global health care enterprise. Mihaljevic succeeded Cosgrove on Jan. 1, coming to Cleveland after serving as CEO at Cleveland Clinic Abu Dhabi. Days before traveling to Cleveland last year for what he expected to be the final interview before he was formally hired into his new role, Mihaljevic had a moment of pause in the operating room. “I was about to finish the surgery and I realized toward the end, if I happen to get this job, this may be the last operation I’ll ever do,” Mihaljevic says. While he had the time to be both a CEO and a surgeon in Abu Dhabi, that simply would not be possible leading the Clinic and its more than 52,000 employees. Instead, he will focus on getting to know his large and diverse team at the Clinic and the challenges they will face together in the years ahead. 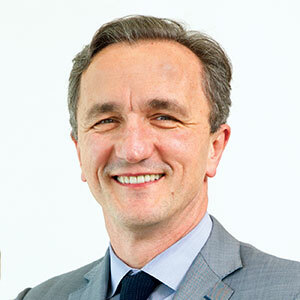 Mihaljevic has been with Cleveland Clinic since 2004, when he arrived as a specialist in minimally-invasive and robotically-assisted cardiac surgeries. He helped build the clinic into the world’s largest robotic practice. He is the author or co-author of more than 145 articles in medical and peer-reviewed scientific journals and in 2005, he received a patent for a novel cardioscopy system for minimally invasive cardiac surgery. His skill as an innovator will be put to the test as he confronts a number of significant health care threats that continue to worsen. “Certainly, the most profound health care issue is the opioid crisis,” Mihaljevic says. Next on the list of burning health care issues for Mihaljevic is infant mortality, particularly in Northeast Ohio. Robert E. Rich Jr., chair of the clinic’s board of directors, is confident Mihaljevic is up to the challenge of leading the organization into the future. “Dr. Mihaljevic brings a depth of experience, first as an innovative, world-class surgeon and more recently as a hospital executive focused on health care quality and safety, patient experience and business strategy,” Rich says. Mihaljevic’s ascension to the CEO role maintains the Clinic’s strategy of having a medical professional at the top of the organization. His predecessor, Cosgrove, spent 30 years as a cardiac surgeon and performed 22,000 operations prior to becoming CEO in 2004. “We firmly believe it’s much easier for a physician or person with a medical background to learn about the business side of the job than it is for a business person to understand the complexities of contemporary health care,” Mihaljevic says. Leading the Clinic is indeed a unique challenge, Cosgrove says. “No place else functions quite like Cleveland Clinic, with its physician-driven, patient-centered ethos that encourages clinical excellence, medical education, research and innovation. I look forward to working with Dr. Mihaljevic in any way that I can to further the Cleveland Clinic mission,” Cosgrove says. The office from which Mihaljevic will work is bright and airy, with a beautiful view of the courtyard below the Clinic’s executive offices. His desk is very clean and it’s clear this is not a man eager to sit in a chair combing through the day’s mail or a stack of paperwork. He likes to be around other people and begins most workdays before the sun comes up, often going out for a run with other Clinic personnel. When you have more than 50,000 people looking to you as their leader, it would be quite understandable to feel overwhelmed by the scope of the job. The Clinic has a 165-acre main campus near downtown Cleveland, more than 150 outpatient locations in northern Ohio, along with facilities in Las Vegas, Toronto, London and Abu Dhabi. Overall, the clinic had 7.6 million outpatient visits in 2017. Mihaljevic recognizes his responsibility, but he takes a measured approach to his work. He says this messaging is constructed around a simple framework. “I always share with our caregivers that what we have to do is think of every patient as our family member,” he says. Beyond that, it comes down to modeling the right behavior for others to follow. Another regular piece of advice he shares revolves around what to do when it’s time for lunch. It’s a simple act, but one that can go a long way toward shaping a more positive, collaborative workplace culture. There is no better man to build that community than Mihaljevic, says Umberto P. Fedeli, president and CEO at The Fedeli Group and a member of the Clinic’s board of directors. “Dr. 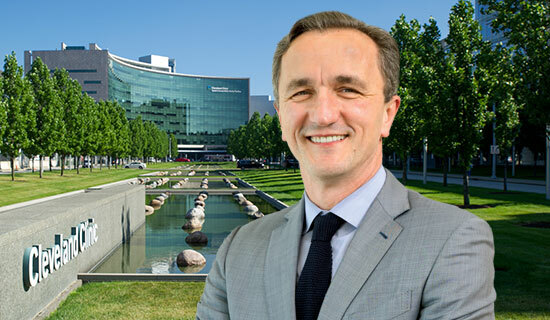 Mihaljevic is an incredible visionary leader with impeccable character and a compassionate commitment to lead the world-class Cleveland Clinic,” Fedeli says. Whatever new challenges the Clinic confronts and whatever new accolades are bestowed upon this iconic health care organization, it will never forget its roots in the city of Cleveland, Mihaljevic says. “We have a phenomenal social impact through the care that we provide and through the jobs that we offer, but also a huge economic impact by bringing all these resources to the city of Cleveland,” Mihaljevic says.